RV Covers, Truck Covers, Travel Trailer, Airstream Covers, Toy Haulers & More! Not sure if you should protect your RV, Motorhome, Camper, 5th Wheel, Trailer or Toy Hauler with a Calmark Cover Co RV Cover? You have read the product info – our covers are 100% USA made (labor and fabric) with zippered doors, double stitching and our own “Friction Reducing Tie Strap” feature FSR® – and all made with the highest quality fabric available – Sunbrella®. Calmark Covers are a premium cover for your recreational vehicle – all custom made to order AND with a FULL 6-year warranty. Why buy a product to save a little that will only last 2-3 years? But don’t let us convince you – our owners (many repeat customers) will do that for you – just read what they have to say! And, if you already own one of our covers, we welcome your comments as well! Just a quick note regarding the cover you all made for our Ironhorse motorcycle trailer. Due to knee replacement surgery, I wasn’t able to fit the cover on the trailer until today. It fits perfectly and looks great! Quality of fabric & workmanship is very evident! I was a little apprehensive, since you only made one other like it. But, I must say it looks like it came with the trailer! Very pleased not only with the cover, but also in dealing with your company. Everyone was extremely helpful from start to finish. Happy Customer, CalMark Cover Co.
Dear CalMark, thank you for holding off my shipment until I got back from my trip. I just received it and I must say your company has been a real treat to work with. You live up to the glowing reports I read on the Casita travel trailer forums. In an age where it’s hard to get customer service from a real person, you guys Rock! 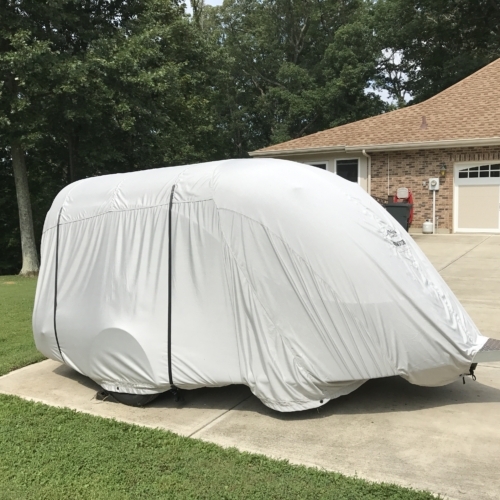 Roy R, CalMark Cover Co.
We received the 5th Wheel Cover on Friday September 28th. I installed the cover this afternoon and it fits great. Please pass along our..Thank You & Great Job ! to everyone involved in manufacturing this cover. I followed the recommendation to cover the gutter downspouts with pieces of foam pipe insulation, but was perplexed on how the keep it in place. I found that a zip tie over the foam seems to work best. I only covered the RV to make sure of the fit, and will now take it off until next month some time. You can be assured that we will recommend CalMark Covers to anyone that wants the very best in an RV Cover, and as a plus is made in the USA! Mel & Karen W , on CalMark Cover Co. The cover went on very quickly and fit like a glove – It should keep the camper in great condition for years. Arlyn Verlo, on CalMark Cover Co. I just wanted to say thank you, the cover you made for my RV arrived yesterday and I put it on today, it fits very well! Vick , on CalMark Cover Co.
Just got my cover and put it on. The fit is perfect and the entry door aligned perfectly. The workmanship appears to be outstanding with quality materials throughout. Thanks for producing such a high quality product. John Burritt, on Calmark Cover Co. I do have to say I was weary about the cover, for the size of the price tag it came with. My cover arrived quicker than I really expected it to. When I unboxed it, I do have to say I did like the material and the looks of the cover. My second thought was, now how do I get this over my van. With the help of my son and very little time we had the job completed. I have to say the fix was perfect, easy to put in place and now looking at the finished product. I think the price was well worth it!!! Only time will tell on how long it will last but I do expect it to be many years before I even think of replacing it. Jim Wells, on CalMark Cover Co.
We just covered our Casita today and wanted to drop you a note of thanks. You may remember this is our second cover, one for up north in Illinois and one for down south in Florida. As always your customer service is excellent. Shipping was on time and the cover fits beautifully as we expected. We like the change in color and thank you for the wheel covers. All the best in 2015, happy new year. John & Judie, on CalMark Cover Co.
Got my Rialta Cover just in time! I got it on before leaving on a cruise just in time to do its job as unexpected tropical storm Isaac hit our area with 3 days of heavy rain and winds over 50 knots! Because the cover fit so well and the provided straps secured it so well, when we returned there was no evidence of anything more than a local rain shower. When I removed the cover three weeks later for a trip, the RV was clean and dry. Great product and well worth the price. ROBERT KAY, on CalMark Cover Co. This Seems to be a great cover, high quality fabric. All 3 zipper doors are placed perfectly. My trailer is a V nose and there is way too much excess fabric up front. Didn’t really capture the V part. Way too much money to spend to have a mistake like that. The rest of it fits great though, so I guess I’m pretty happy overall. Roy Browning, on CalMark Cover Co. The Calmark products are the best. We had two other covers prior to 2007 when we purchased the Calmark cover. Prior to Calmark I had to replace the cover every year. Now I have had my Calmark since 2007 and now 8 years later, I am purchasing a new cover. The 2007 cover is still usable but I am buying another since my 5th Wheel still looks like New thanks to the Calmark cover. Jim Wilkes, on CalMark Cover Co.